KitMonsters – The Blinders. The music makers’ guide to making music. 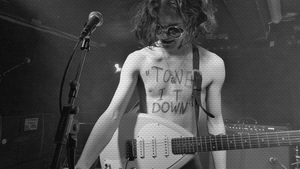 Dubbed ‘Britain’s most switched on rock band’, The Blinders play visceral political punk rock that’s also gloriously anthemic. Their debut album ‘Columbia’ is on pre-order now, and their latest blistering single is ‘L’Etat C’est Moi’. Constantly gigging they’ve galvanised an army of fans around the country with sell-out shows, and amassed plenty of radio play. 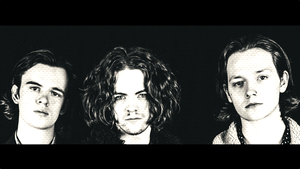 The Blinders are Thomas Haywood, Charlie McGough and Matt Neale. Full tour dates here. 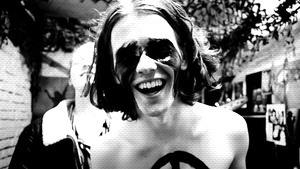 Passionate, political and packing a punch - The Blinders are on the move and the only way is skyward if their anthemic new single ‘Brave New World’ is anything to go by. With a load of festival shows lined up we wanted to know more about what feeds their sound and how they make their music. Charlie: We all knew each other from school and had played in school bands together, so to speak. After secondary school Thomas and I went off to the same Six Form and Matt went off to some music college. Thomas then spent a couple of months nagging Matt to leave this band he was playing in and come down for a jam. Thomas: And here we are. Matt: Should have stayed with them. Charlie: We’re all from Doncaster, we come from mining villages or mining families. It’s one of the many towns around the country that has been left behind, left to rot really. For us it seems like you can’t come from where we come from and not be political. Thomas: It’s as if you can’t not hold resentment for those who drove these towns into figurative ruin. Charlie: But I suppose then, isn’t that the same for everyone? Since moving to Manchester, supposedly a modern, forward-moving city, we’re still faced with many of the same issues and have perhaps found it even more of a politically motivating environment to live in. Thomas: We’re creatures of both habit and absorption. We’ve sucked what little life there is left on these walls and put it into song. It’s just what we do. Charlie: Our songs start with the lyrics or in fact a piece of poetry that will then be ripped up, restructured and reconfigured, if you like, leaving us with something that looks a bit more like a song. This will be done usually in a back and forth pattern between Thomas and Myself. We then all come together and Matt has a big role in the structuring and formation of the music, he really comes into his own there. It’s very much a collective process within which we all input our small areas of expertise, so to speak. Thomas: at the fittingly named ‘Magic Garden Studios’. Charlie: We tend to go into the studio with the songs already written. The exception being our last release, Brave New World, which was a lot looser in structure. Thomas: I personally preferred this system of going in with the bare bones of a song. You tend to get attached to your own ‘complete’ songs; they become a living entity that just sounds wrong when changed, for want of a better word. We’re currently looking to alter our recording style in order to attain a comfortable system. This will most likely happen using live tracking and recording guide tracks simultaneously, as oppose to previous recordings where the tracks are all completed separately. Charlie: Way off. We’ve hopefully got an EP or two in the works before we even consider an album, but an album is what we are working towards. Matt: Hold yer horses, calm yer camels. Are you self-releasing and how’s that going? Charlie: We are indeed. The trials and tribulations of releasing music today are pretty well covered and known. It’s a struggle, everyone’s trying to be heard and it’s very easy to feel like you’re shouting into a vacuum. The reward really comes when you go a bit away from home and meet a crowd singing along to one of the tracks, that’s when our heads inflate and we must be held down from fear of floating off the stage. Charlie: Thomas likes to belt out a few Beatles tunes or anything that comes into his head to warm up his voice around twenty minutes before we go on, Matt goes through a few stretching routines and I just stick on my suit. Matt: Confident lunges and beer. Don’t wanna be caught with a pulled hammy or sober do you now. 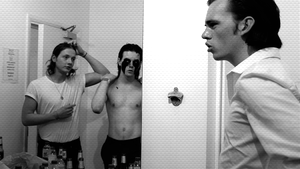 Thomas: We haven’t yet developed an elaborate pre-gig ritual yet… contrary to popular belief. So long as we’re well watered and ill-fed, we’re usually ready to go. 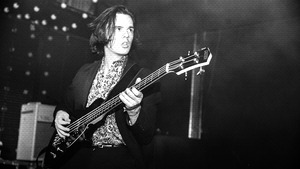 Charlie: We’d have to say supporting Cabbage at the Ritz in Manchester. As a support band, you don’t expect a great deal from the crowd, a nod of appreciation is good enough but the crowd were wonderful. It was simply a great night of music. 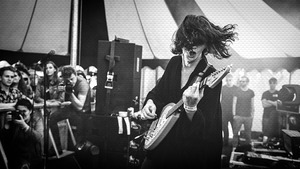 The crowd were the same for our dear friends Strange Bones whom also played the night, and Cabbage took the roof off. It was a pleasure to be part of a night that felt truly special. Matt: I’d agree. I believe it was our 150th gig, in front of 1,500 people. Pretty cool I guess. You’ve a reputation for getting blood-stained instruments, how does that happen? And what are your tips for cleaning a blood-stained instrument? Thomas: Almost always it’s the simple slip of a plectrum doused in sweat and, being already too committed to the frenzied stage-mire, your attempts to pick it up would be futile. A rush of blood to the head takes over and before you know it, you open your eyes to a dirty instrument and a displeased roadie. Matt: Don’t clean ‘em, just leave the blood all over your snare. Charlie: We’ve always attempted to take inspiration from more than simply the music we listen to. Poetry, art and particularly literature certainly inspire us to write and alter our outlook upon our surroundings. Beat literature and the writings of Orwell and Huxley are pretty self-evident in our music and it probably explains why the lyrics are so central to what we do. Charlie: We’ve a few more festivals to play: Reading, Festival No.6, Rec Rock before heading out for a run of shows with comrades Cabbage. Keep an eye out for releases or news of releases. I’m currently rolling with a Vox Mk III ‘Teardrop’, and I use a Line 6 Spider IV short board, which is essentially the fax machine of pedal boards if you’re looking for some form of comparison. The Vox Mk III always intrigued me. Brian Jones was famous for possessing the ability to pour his heart out from one. As far as the Line 6 Spider IV short board is concerned, it’s a shortcut pedal compatible only with the amp I’ve owned since I was 13. I create all my sounds, painstakingly, on this outdated piece of tech and I’ll probably stick with it for the rest of my life, due to the nature of uniqueness that comes with the little fucker. If I were to describe my playing style, I’d try to hint at some form of structured improv for the most part. We almost always have the lyrics before the music. I enjoy putting music to words. In fact, I often take other people’s songs and put my own tune to them. Call it a hobby. I digress; I try to create a sonic storm worthy of the likes of Fat White Family for example, except with just the three members, not six. It’s all very fun to even try to attempt, but I feel we get by just fine. The Lizard King and Johnny Dream. I’m currently playing a Gretsch Electromatic. I’ve not got a lot going on in term of a pedal board; it’s simply a tuning pedal and a Big Muff. Not too complicated. After starting out playing the guitar and only picking up the bass when the band started, the Gretsch felt right to play. It was also pretty cheap and our budget isn’t the biggest so you’ve gotta make the most of what you’ve got. I’ve certainly approached it very much from the style of a guitar player unconsciously. It’s probably not advisable but it’s got us this far. I’m sure they read somewhere that Lemmy did the same, he can’t be the worse figure to follow. In terms of sound I think it’s something we’re still exploring especially within the realms of a three piece. On the first EP, the bass had a bit of a Pixies feel to it, we’ve slightly digressed from that path now. In terms of bass players you’ve got to look to the likes of Simonon, John Paul Jones, Entwistle for obvious reasons. One big one at the bottom and 3 smaller ones in front of me. 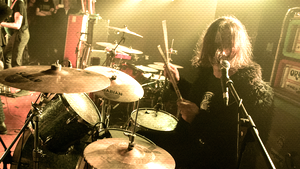 Hi-Hats, Single Crash & Ride. Nice and easy. My current gig kit is a Mapex I got when I was 10. I would get a newer one but I’m waiting for someone rich to buy me one. I’ve always played with a single high tom and a floor tom, It feels right and I like my Ride quite close to me so it works out. Also only having minimal gear helps with loading the van too. Not that Thomas would know anything about that. Loud & Fast. With it being a 3 piece, each of us have a huge role to fill to make sure it doesn’t sound empty, kinda forcing me to play a lot of ride and hefty beats. In terms of sound, I get a lot of influence from my favourite drummers. Bonham, Baker, Mitchell & Moon to name a few. You can see the recurring pattern, I should probably get some earplugs.